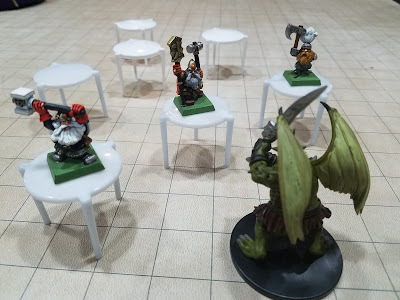 After sitting behind the DM screen for many years you learn a few things. 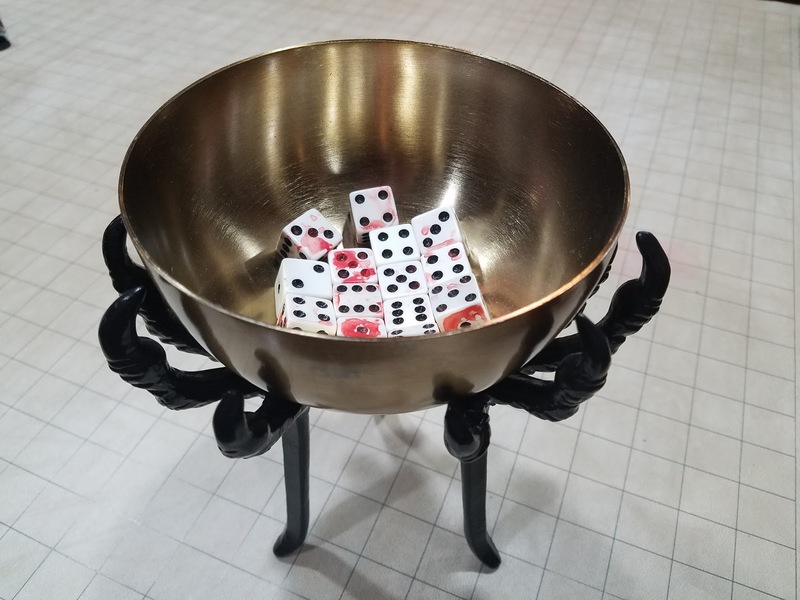 As a Dungeon Master, I’m always on the lookout for cheap, but effective ways to improve the tabletop experience. Listed below are three DM Lifehacks I think will benefit you, but obviously every group is different. If you have any hacks of your own please feel free to share them in the comments section. Since the early 1980s I have seen countless attempts at initiative trackers. I personally have used everything from a dry erase board, legal pad, 3x5cards, and even designated a player to do it. There have even been apps developed for it and recent crowd funding projects. But nothing has done a better job than the simple old clothespin. You can buy them in bulk from the dollar store and then all you need is a few sharpies. 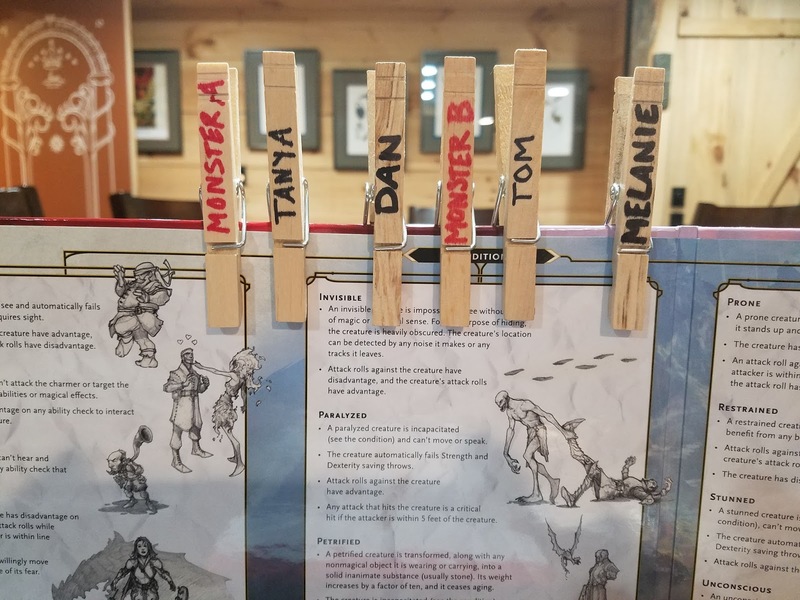 They can be clipped right to your DM screen and are in plain few of everyone in the room. If you don’t use a DM screen they can be attached to just about anything else on the table. I have seen people use everything from a metal paper towel stand, to a upside down box lid. So, you also want to speed up combat? Think about clothespins for visible initiative tracking. They come with your pizza order to keep the cheese and topping from sticking to the box. Showing elevation from flying or levitation has always been a challenge with miniatures. Most gaming groups order pizza anyway, and you get these free elevation stands! In my current Sword & Planet campaign we are using them to represent hover skiffs. I have seen another DM mentioning the use of narrow straws on the tripod legs to raise them even higher. If you’re using a battle map it’s easy just to write elevations next to the stands as well. They also have various uses for spells such as Spider Climb, or even Floating Disc. The limit really is your imagination when it comes to little hacks such as this. Certainly, as a quick reference they make for an easy table visual that comes with a delicious treat! I first mentioned these in my Death House post last year when originally dreamed up. I have always been in favor of bennies (slang for benefits) in my D&D games. With the introduction of Inspiration as a mechanic in 5E I wanted to take it a step further. With Dark Inspiration, there is a pool of six-sided dice prominently displayed in the middle of the game table. At any time, a player may use this resource to increase an attack roll, skill check, or saving throw. The catch? The player also hands the DM one of the dice, who can use it anyway they see fit as the adventure progresses. For those of you starting Tomb of Annihilation, this is a perfect mechanic to add more danger and suspense to the lands of Chult! In terms of creation, I used some old board game D6s and splattered them with reddish-brown acrylic paint. The blood represents the overall danger of using this power…as it will backfire on you eventually!